Shallots are one of the more elegant members of the Allium family. They provide vitamins A and C, folic acid, potassium, calcium, and iron, as well as fiber. In at least one study, shallots were found to have more phenols and higher antioxidant activity than most of the commercially available varieties of onions. This means that they may be even better than the other Alliums at lowering blood pressure, preventing atherosclerosis, and inhibiting the onset and proliferation of cancers. One tablespoon of chopped raw shallots provides 7 calories, 1.7 g carbohydrate, 0.3 g protein, 0 g fat, 0 g dietary fiber, 1248 IU vitamin A, 1 mg vitamin C, 3 mcg folic acid, 33 mg potassium, 1 mg sodium, 6 mg phosphorus, 4 mg calcium, and 2 mg magnesium. Popeye the Sailor was ahead of his time! Spinach provides vitamins A, C, and K; B vitamins including folate and riboflavin; and the minerals iron, calcium, magnesium, manganese, potassium, copper, phosphorus, zinc, and selenium. Vitamin C helps the body make use of the iron found in spinach. Although cooking reduces the vitamin C, it helps make the iron more bioavailable in other ways, so spinach is a better source of iron when cooked. Consider serving it with an additional source of vitamin C to enhance iron absorption. Spinach is also rich in antioxidants and even provides some omega-3 fatty acids. It is an excellent source of lutein, which appears to protect the eye from sun damage. People whose diets are high in spinach were found to have reduced their risk of both cataracts and age-related macular degeneration. Spinach is one of the foods that contains measurable amounts of oxalates, so over-consumption can cause problems for those with kidney disease, gout, vulvar pain, rheumatoid arthritis, or other conditions that may require a low-oxalate diet. The oxalates in spinach may also interfere with the body�s absorption of some of the minerals spinach provides. One-half cup of boiled spinach provides 21 calories, 3.4 g carbohydrate, 2.7 g protein, 0.2 g fat, 2.2 g dietary fiber, 7371 IU vitamin A, 9 mg vitamin C, 131 mcg folic acid, 63 mg sodium, 419 mg potassium, 122 mg calcium, 50 mg phosphorus, 78 mg magnesium, and 3.21 mg iron. The summer squashes include yellow squash, yellow crookneck, and pattypan, as well as zucchini, which is so numerous it gets its own entry! Tender, yellow summer squash provides vitamins A and C; the B vitamins B6, riboflavin, niacin, and folate; and the minerals potassium and magnesium. They are a good source of fiber and, at 93 percent water, low in calories and helpful for staying hydrated in the summer heat. They also provide lutein and zeaxanthin, two carotenoids that help preserve vision. One cup of sliced raw summer squash provides 12 calories, 5.2 g carbohydrate, 1.2 g protein, 0.4 g fat, 2.4 g dietary fiber, 440 IU vitamin A, 10 mg vitamin C, 30 mcg folic acid, 276 mg potassium, 2 mg sodium, 42 mg phosphorus, 28 mg calcium, and 28 mg magnesium. Swiss chard is a green that is closely related to beets. The same betacyanins and betaxanthins found in beets are found in chard. Swiss chard also contains antioxidant phenols and flavonols, which have been shown in the laboratory to inhibit the growth of some types of cancer cells. Chard is an excellent source of vitamins C, E, and K, and the minerals potassium, magnesium, iron, and manganese. It also provides the B vitamins B6, thiamine, niacin, and folic acid, and the minerals calcium, selenium, and zinc. It is a good source of carotenes and fiber. With 27.4 percent of the recommended daily value for potassium and 47 percent of the recommended daily value for magnesium in a one-cup serving, chard helps keep blood pressure down. Swiss chard does contain measurable amounts of oxalates, so over-consumption can cause problems for those with kidney disease, gout, vulvar pain, rheumatoid arthritis, or other conditions that may require a low-oxalate diet. One-half cup of boiled, chopped Swiss chard provides 18 calories, 3.6 g carbohydrate, 1.7 g protein, 0.1 g fat, 1.8 g dietary fiber, 2762 IU vitamin A, 16 mg vitamin C, 8 mcg folic acid, 483 mg potassium, 158 mg sodium, 29 mg phosphorus, 51 mg calcium, 2 mg iron, and 76 mg magnesium. Tomatoes are one of nature�s best sources of lycopene. Cooking tomatoes makes the lycopene more available, but that doesn�t mean you need to avoid raw ones. One cup of raw tomato still provides plenty of lycopene, as well as lutein, vitamins A and C, carotenes, anthocyanins, and potassium. It is the lycopene, however, that has made tomatoes a SuperFood. It may be the best substance for quenching oxygen free radicals, and it helps protect the skin from the aging effects of ultraviolet light. Lycopene has been researched for its potential in combating several types of cancers, including prostate, breast, pancreatic, and intestinal cancers. Interestingly, however, in some studies lycopene alone did not convey the same protection as eating a diet rich in tomatoes. So there are certainly more health-protecting treasures inside this versatile food. A study in 2007 found that broccoli and tomatoes together were better at fighting prostate cancer than either vegetable was alone. Although the study was done on rats, the tomato-broccoli combination was effective enough to have strong implications for humans as well. The fiber and antioxidants in tomatoes have been shown to lower cholesterol levels and stabilize blood sugar levels. In at least one study, a high dietary intake of tomato products significantly reduced both low-density lipoprotein (LDL), or �bad� cholesterol, and total cholesterol levels, while making the cholesterol less vulnerable to oxidation. One raw red tomato provides 26 calories, 5.7 g carbohydrate, 1 g protein, 0.4 g fat, 1.4 g dietary fiber, 766 IU vitamin A, 23 mg vitamin C, 18 mcg folic acid, 273 mg potassium, 11 mg sodium, 30 mg phosphorus, 6 mg calcium, and 14 mg magnesium. Turnips�both the root and the greens�are cruciferous vegetables. Although the root has a long history as a staple food, the tops are much richer in vitamins, minerals, and fiber. The green leaves are a good source of vitamins A, C, and K, as well as folate, copper, and calcium. They are high in lutein and beta-carotene, which help protect eyesight and preserve the linings of blood vessels. Turnip greens are packed with antioxidants, and the B6 and folate help reduce levels of homocysteine in the blood, protecting the walls of blood vessels and helping prevent atherosclerosis. One-half cup of boiled, chopped turnip greens provides 14 calories, 3.1 g carbohydrate, 0.8 g protein, 0.2 g fat, 2.5 g dietary fiber, 3959 IU vitamin A, 20 mg vitamin C, 85 mcg folic acid, 146 mg potassium, 21 mg sodium, 21 mg phosphorus, 99 mg calcium, and 16 mg magnesium. Watercress provides vitamins A, B6, folic acid, C, and K; the minerals iron, calcium, iodine, and manganese; and beta-carotene and lutein. Watercress is related to cabbages and mustard greens and provides some of the same sulfur compounds that have been found to be protective against some forms of cancer and heart disease. It is more than 95 percent water and extremely low in calories. One cup of chopped watercress provides 4 calories, 0.4 g carbohydrate, 0.8 g protein, 0 g fat, 0.6 g dietary fiber, 1598 IU vitamin A, 14 mg vitamin C, 4 mcg folic acid, 112 mg potassium, 14 mg sodium, 20 mg phosphorus, 40 mg calcium, and 8 mg magnesium. 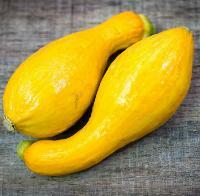 Zucchini provides vitamins A and C, folate, potassium, manganese, lutein, and beta-carotene. Although it is 95 percent water and 4 percent carbohydrate, zucchini is a low-calorie source of antioxidants and anti-inflammatories, as well as some of the phytonutrients that help protect vision. The manganese in zucchini (one cup provides 38 percent of the recommended daily value of this mineral) is a vital cofactor in a number of enzymes, including some that help cells maintain their shape and others that are essential to metabolic Carbohydrates: �True� Vegetables 161 processes. Manganese ions are essential to the process of neutralizing superoxide free radicals, which are quite toxic. One cup of sliced raw zucchini provides 18 calories, 3.8 g carbohydrate, 1.6 g protein, 0.2 g fat, 1.6 g dietary fiber, 442 IU vitamin A, 12 mg vitamin C, 28 mcg folic acid, 322 mg potassium, 4 mg sodium, 42 mg phosphorus, 20 mg calcium, and 28 mg magnesium. Amaranth is native to South America, Asia, and Africa. It grows easily and can be prolific in producing seeds. 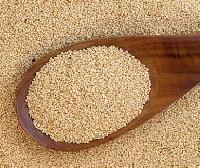 Its high-protein, gluten-free seeds are used as a grain, though technically amaranth is a pseudograin. For a plant source, it is also a relatively complete protein, because it includes lysine, an essential amino acid that grains often lack. The seeds are high in fiber and provide the minerals iron, magnesium, phosphorus, copper, and manganese. In some countries, especially India and Africa, amaranth leaves are eaten as well. Although these greens are high in many vitamins and minerals, they are also high in oxalic acid. Both the flowers and leaves have been used in some forms of traditional medicine. Amaranth seed appears to help reduce blood pressure and cholesterol, an effect not only of the seeds� fiber content but also of chemical substances called plant sterols. These sterols become stanols, some of which are known to reduce lowdensity lipoprotein (LDL), or �bad� cholesterol. Other stanols are used by the body to make steroids, which can have important anti-inflammatory properties. One-quarter cup of organic whole grain amaranth provides 180 calories, 31 g carbohydrate, 7 g protein, 3 g fat, 7 g dietary fiber, 2.4 mg vitamin C, 8 mg calcium, 3.6 mg iron, 0.03 mg thiamine, 0.1 mg riboflavin, 0.8 mg niacin, 0.02 mg folate, and 200 mg phosphorus. Barley was one of the first grains cultivated by humans. Whole barley contains all eight essential amino acids, making it a complete protein. Raw barley is also a good source of niacin and vitamin B6, as well as the minerals phosphorus, iron, magnesium, and zinc. One cup of barley provides 14.2 percent of the recommended daily value for niacin. Barley also provides some lutein, which may help preserve vision. Barley is very rich in fiber�nearly 16 percent dietary fiber by weight. Fiber helps prevent constipation, and it helps the colon stay healthy by helping intestinal flora produce butyric acid. Dietary fiber also reduces blood cholesterol levels, and whole grain barley contains enough soluble fiber that the Food and Drug Administration (FDA) has recognized it as a food that can reduce the risk of heart disease. Taken together, barley�s fiber and its B vitamins, which help preserve the health of blood vessels, make barley an especially heart-healthy grain. Barley provides magnesium, a mineral that acts as a co-factor for more than 300 enzymes, including enzymes involved in glucose metabolism and the production of insulin. Studies have shown that barley may be even more effective in stabilizing glucose and insulin responses than oats. It appears to regulate blood sugar for up to 10 hours. Health Benefits of barley were observed as long as 2,400 years ago by Indian physicians who recommended substituting barley for white rice, along with losing weight and increasing activity, to treat the disease we now identify as type 2 diabetes. Barley is even mentioned by Islam�s founding prophet, Muhammad, as effective against seven diseases�including grief. Most of the Benefits of barley come from the whole grain form�called �hulled� barley, because only the inedible husk has been removed. Hulled barley retains the healthful bran and germ. Unfortunately, the more widely available �pearled� barley has been steamed and polished to remove the bran. 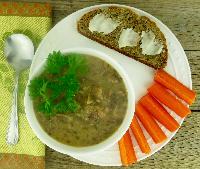 To get the Benefits of barley, you�ll have to seek out the hulled, whole grain form. (cooked barley) One cup of cooked, pearled barley provides 193 calories, 44.3 g carbohydrate, 3.5 g protein, 0.7 g fat, 6 g dietary fiber, 11 IU vitamin A, 3.2 mg niacin, 25 mcg folic acid, 146 mg potassium, 5 mg sodium, 85 mg phosphorus, 17 mg calcium, 2.09 mg iron, 35 mg magnesium, and 1.29 mg zinc. (raw barley) One-quarter cup of raw, hulled barley provides 163 calories, 33.8 g carbohydrate, 5.7 g protein, 1.1 g fat, 8 g dietary fiber, 10 IU vitamin A, 2.1 mg niacin, 9 mcg folic acid, 208 mg potassium, 6 mg sodium, 121 mg phosphorus, 15 mg calcium, 1.66 mg iron, 61 mg magnesium, and 1.27 mg zinc.